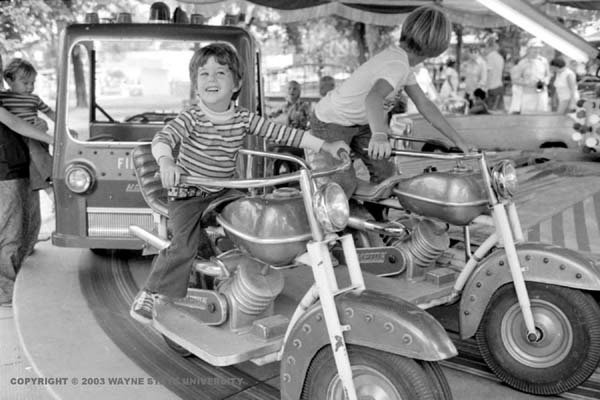 Notes: Thanks to A Tribute to Bob-Lo Steamers for park pics. 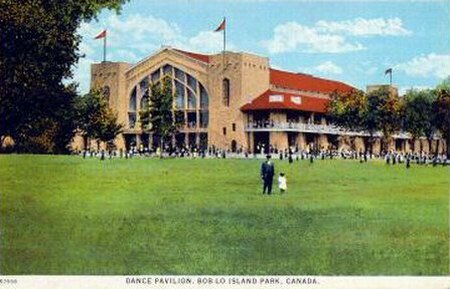 I was one of the last generations of people who were able to enjoy Bob-Lo island amusement park. I was 7 years old when the ferries stopped running in 1991. To tell you the truth I remember the boat rides to the park more than the park itself. Getting to the dock in Detroit early in the morning, the anticipation of boarding the boat, the ride on the river, the views, the fact I could play an arcade game on a boat blew my small mind. What I remember about Bob-Lo Island specifically, the entrance coming off of the boat, one of the last times I went the Simpsons were the mascots and I met Bart and Homer. I also remember the space needle, cork screw the nightmare, log ride, and some sort of bounce house kids area. It is a shame that the park could not be saved or salvaged, now everyone goes to cedar point and more potential state income does too. 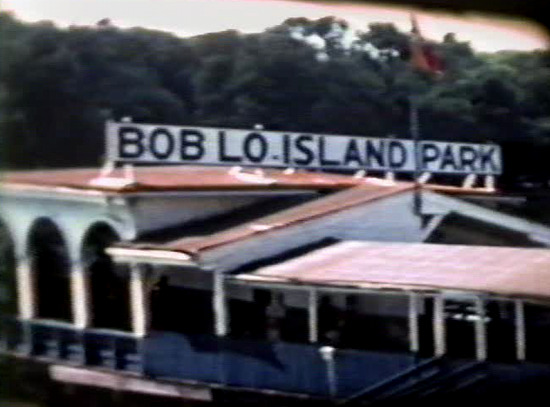 When we had family or friends from out of state come in we used to love taking them to Bob-Lo island. It is such a travesty that anything left in the hands of Detroit has been left to waste like this. I remember Bob-lo and feel that it was one of the great things about Detroit along with the Grand Prix to which neither is around anymore. I wish that bob-lo was still around so that I could take my son and show him how great things from my childhood were. Detroit really needs to get it together and restore/revitalize things of this nature. :(. 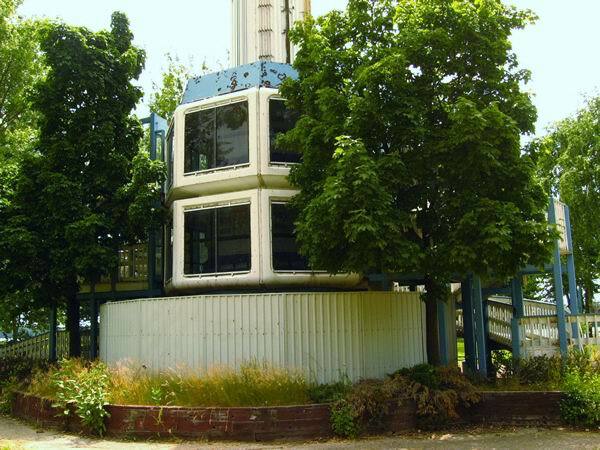 I can remember the Wild Mouse ride, and shooting the BB machine gun at the red star. Being broke on the way home and finding a $5 bill on the boat thinking we was rick. LOL God why can't good things last?. A couple things. Rather amazingly, the docks on the Detroit side sits stunningly preserved with some overgrown weeds and general damage, but the building looks solid compared to many of the area around. 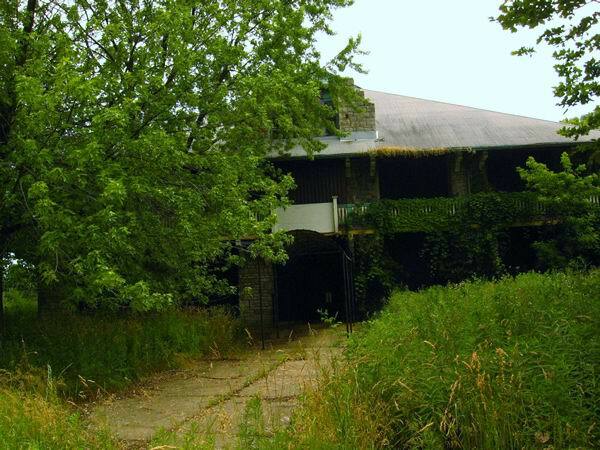 Driving down Fort St. , the building (about 50 yards from the road) sits fully exposed and in plain sight. 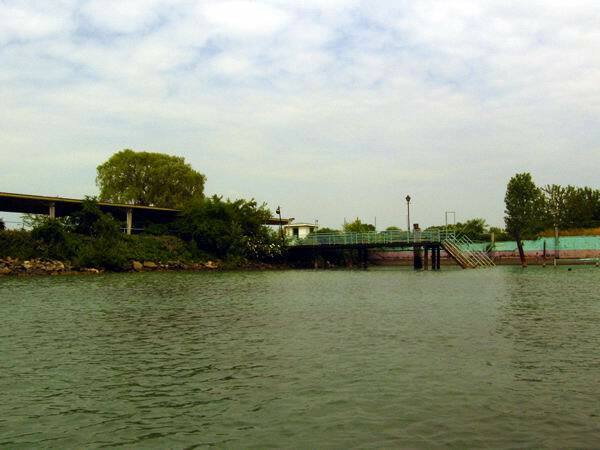 But, any renegade photographers thinking of getting a look inside the old docks on the Detroit side (the one from the Detroit Dock picture below) and posting them. Don't! A professor at a local university informed me (and what I didn't see mentioned here is) the docks on the Detroit side are now actually under the control of Homeland Security. Beyond this here are a couple things. The Simpsons were, at one point, mascots for Boblo. In the final seasons (early 1990s), Bart Simpson actually appeared on the Lets Twist Again commercials (if you remember them), swinging from one of the Os in Boblo. During this period, there was an indoor roller coaster, The Nightmare which (to my knowledge) is currently in operation under a different name at a different park. The Nightmare was actually a big draw at the park in the early 90s. Basically, the ride started out in the light, descended into a darkened tunnel and remained dark until the end of the ride. I couldn't tell you what it replaced (only took the kids there once in this period, they were too old), but I remember the marketing campaign for it was pretty prevalent at the park. 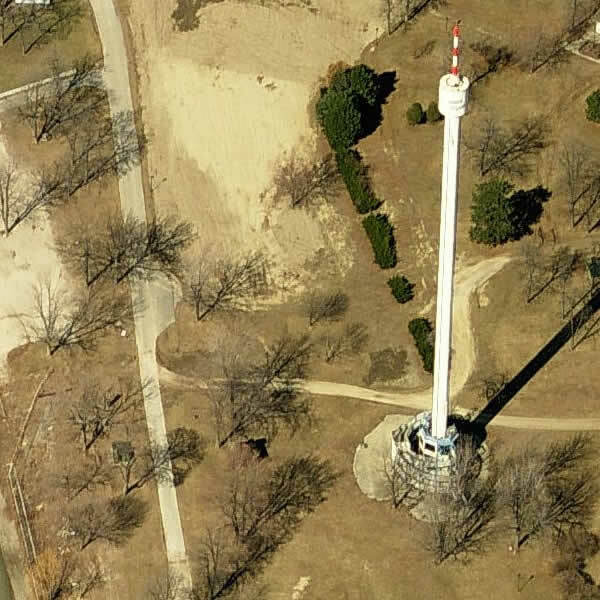 It's interesting to read the history of this park from others. I didn't grow up around here, but a couple company picnics took me here and wondered what became of the place and, sadly, just found much of what people are posting out within the last year. I am 73 years old and remenber my parents taking me to Bob-Lo after picking me up at Willow Run Airport after a visit with relatives in Miami FL when I was 8 years old. what a fun and exciting place. i remember going to boblo, like it was yesterday! !we went in the late 50's early 60's. the kids today will never know what they missed. boarding the boat. running up and down all the decks. running past the souvineer shop( i sure wish i had some of them now!!). the big bands playing on the lower level with people dancing. walking by on the lower lever watching the engine going remembering the smell of the burning oil. going all the way to the top deck to see the captains house as we called it back then. then waiting to see the best sight ever. boblo island and dying to get off so we can ride those rides. i used to LOVE the catipillar ride. it would go in a hilly circle and then a canvas cover would go over it and we would ride in the dark for a few minutes. then the exciting ride back home. more running all over the boat. then when we got back to the detroit dock and in the car me and my sisters would be fast asleep for the ride home. we went a few times every year. what a fun time. i sure do miss those days!!!. Oh! How I recall the fun times of going to Bob-Lo, with my sisters and brother. He was 20 years older than me. So when we went to the Island, we took a cab to the downtown docks to catch the first boat out and then we would return on the last boat. I can still feel the sun and the wind as one of the great boats took us to the Island. My favorite ride was the Log Ride, I thought it was the greatest thing of all time. Went there many times as a kid. Now I often boat between Bob-Lo and Sugar Island and always tell my kids and there friends about it and point out the tower. They usually don't get it but I always get the tower in the background when they ask me to take pictures of them on the boat - LOL. 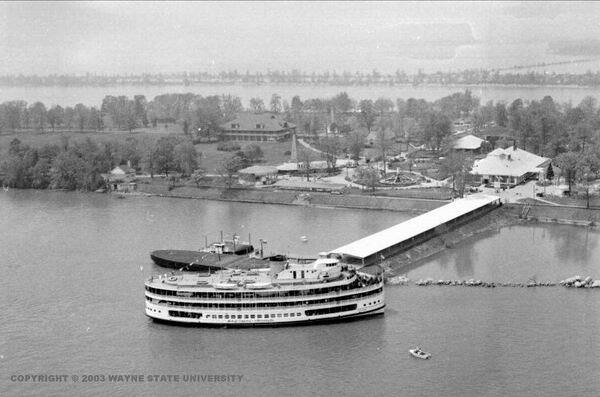 went to Bob Lo for the 1st time in the mid 60's with grade school classmates from Our Lady Gate of Heaven in Detroit for end of school year reward, was always lots of fun, from the bus ride downtown to the boat rides to the amusement park, nothing but great memories, a real growing up and coming of age time, seems like times were much more simple and innocent then, also visited in the 80's with my daughter Courtney, was still much fun, place was always packed, very disappointed when it was closed. Loved going to Bob-Lo as a kid. In fact didn''t go as much as I would of liked to. 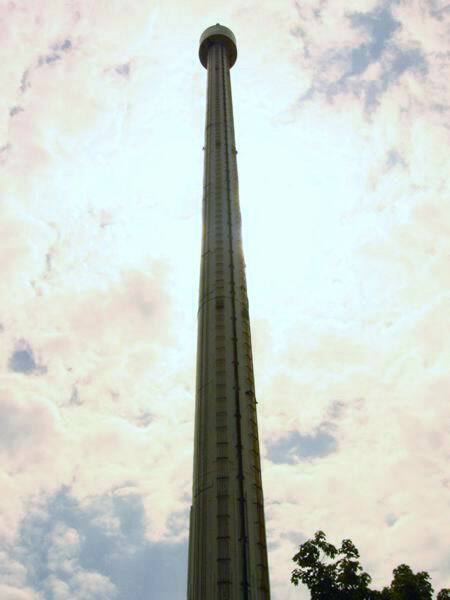 My most vivid memory is the Sky Diver ride. Before I rode on it on the Island I had gone to a local fair and 3 other girls and I rode together on it and we laughed and really enjoyed it. Well later that same summer (1972) I went with 2 of my brothers, one older and one younger with our Mother. I bragged the whole time about how much fun the ride was and they were just chickens not to go on it. Which they did not. Well I got on this ride and now being the only one in the car it started to go around. 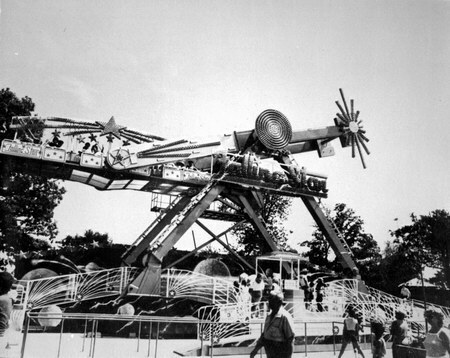 If you''re not familiar with the Sky Diver you sit in a kind of box shaped car that is on a Ferris wheel and as it goes around you not only look like you are diving into the ground but it tumbles also. Well being in there alone this time it was not the same experience. I was being thrown all around in there and I began to scream, Get me off this thing and every time the wheel would go around I could see my brothers and my Mother pointing and laughing their heads off at me. Ya, who was the chicken now. My brothers still tease me on that one and until my Mother passes she would often remember and start to giggle all over again. 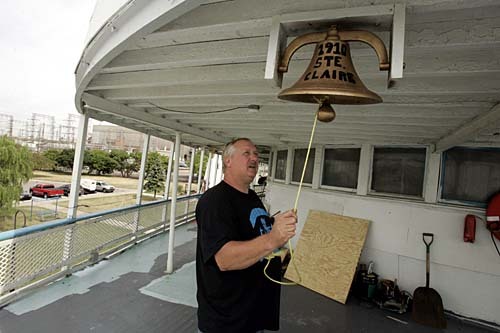 The story telling of getting the St. Claire under way towards recovery goes to a few people that started the process rolling. John had seen a haunted house and a haunted boat during his travels. We were friends that have participated in ventures with each other in the past. 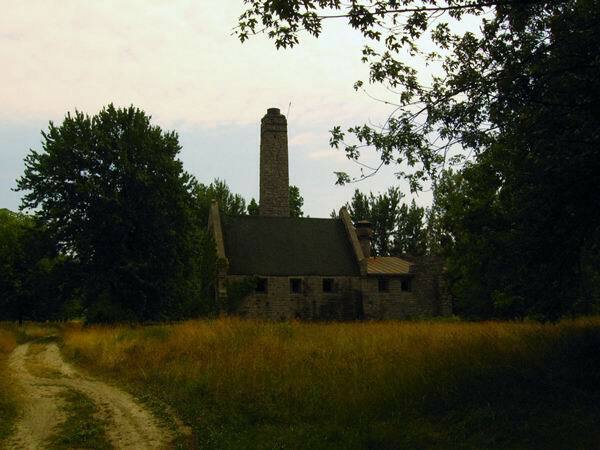 He called me asking about a building,boat,barn,lodge any thing to make a haunted place out of. We jabbered for hours and after a few days I called him telling we should try to get one of the BoB-Lo boats. We went to work, each duing our thing. John and his crew worked with the coast guard, and histoical owners along with clean up. I had my wive, son-in-law, and very good friend. We also were lucky to have so many people help. My wive and I used our half of the purchase cost money to pay the towing company for the tow from Detroit to the dry dock at Toledo Ohio. 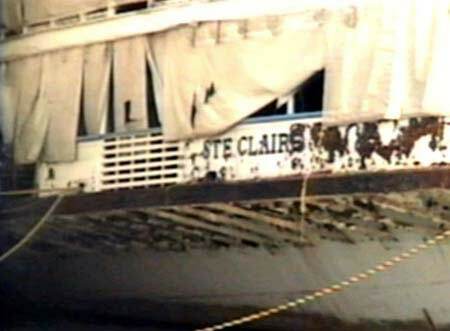 The news of the 911 attacks in New York came just as we were getting the St. Claire turned headed down stream. A few minites later the second plane hit the second tower. We were going to have air craft news taking film but they were forced to land. They only took a short amount of film. Karen and I sold our share in the St.
Claire on Valentines Day the following year. After working through the winter with our friends making quite a big gain in the boat and the whole restoration project. 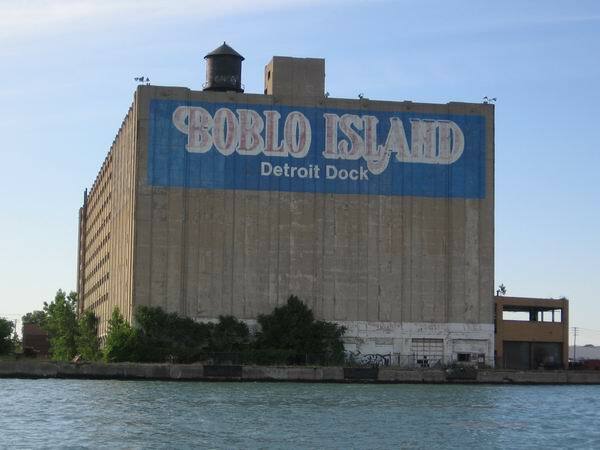 Going to Boblo Island is such a great memory of mine and growing up in Detroit. The whole family would go on St. Andrews Day for the Highland Games. My sisters and cousins competed in the Highland Dancing and my cousin in the bagpipe competition. The ride there was so much fun and we would dance our hearts out and stake out our spot around the dance floor. On the way home the bagpipes would be playing and everyone had such a great time. This was every year throughout the 60''s. I also remember running all over that boat, looking at the engine so powerful, and peaking into the lovely ladies room/lounge. We were safe and happy. My Father grew up in Port Huron Michigan. There was a group of 11 couples, who graduated from St. Stevens. They stayed close although their lives took them to numerous locations across the U. S.
At least once a year, and of course for weddings and funerals, the group would re unite. They came to call themselves ''The Port Huron Gang. One of the members of this group was in charge of the operational aspects of all the rides on Boblo Island. I believe his name was Bruce MacKinnen. 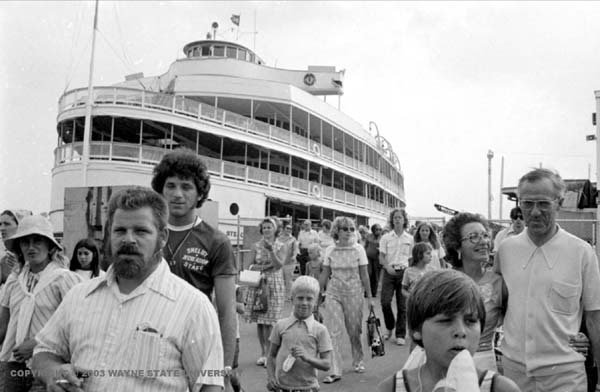 The day before the island opened for the summer season Bruce would have the Port Huron Gang to the island for the day. 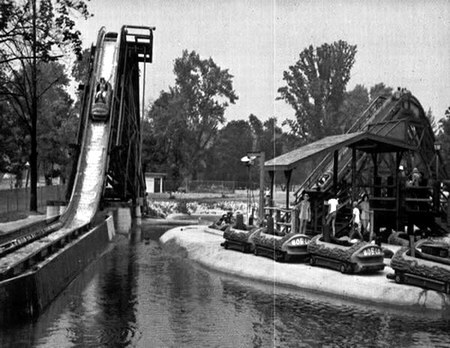 It would include a picnic but most important to a 6 year old, a day of FREE rides!This in the years 1946 and 1947. I work on the boat in 1969, Browning''s own the Cloumbia and the Claire, Rudy was the dock manager and my boss, always had a cigar in his mouth. Ann was the boss on the boat. Had some great times working. George W and I were 17 working with 6 college girls. We would take turns going on the island on the midnight cruise. I would take Nancy. George would take ??? We make 4 trips a day from Det. 18 miles each way. The food in the galley was great, It was the best time. 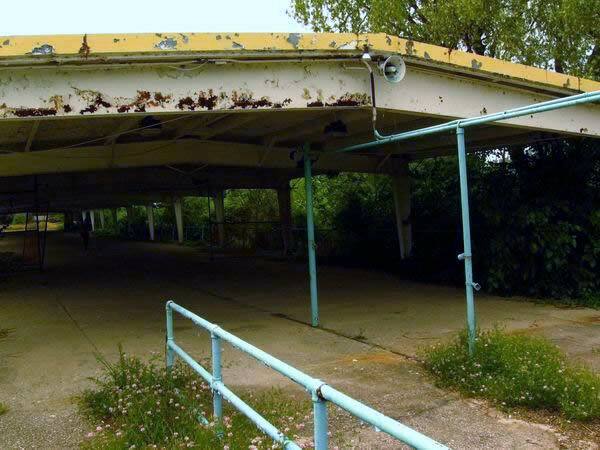 I took all 4 of my kids there every year till it closed. My oldest gril liked it so much she had year pass in HS. I just recently turned 47. My dad died in 2005. 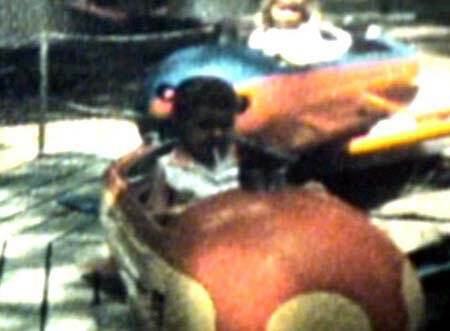 I was Five when my dad introduced me to the Wild Mouse ride. I thought that it was fantastic! 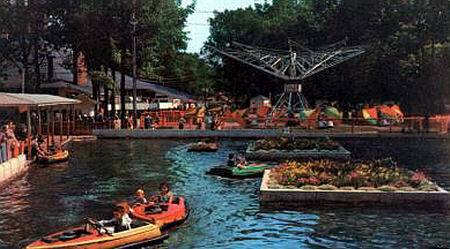 I can still remember seeing the tops of the trees and the water, and then that sharp turn, such a thrill! We got off the ride , I wanted to go again, but mom said no and my dad gladly agreeed because he was a little on the pale side after that ride!Sad to hear it is no more. I will just have to keep those memories of that fun day!. I am sorry to see that the park is no more. I have always talked to my kids about the time I went to the park with my relitives in the 80''s while visiting. It was a wonderful time. During my family''s next visit to Michigan, we will search out another park to visit. I remember Bob-Lo Island very well. We always went as a family the first Saturday in August for the St. Andrews Highland Games. My mother & father were from Scotland and they would gather with all their British-American friends for the day. I know we were going in the early 1940''s and possibly sooner. We kids were able to run up and down the stairs on the boat and go to the dance floor. It was in a time when the parents didn''t have to worry about the children. I remember the log ride, where we''d all get wet but would soon dry out running about, the carousel, and of course the roller coaster. 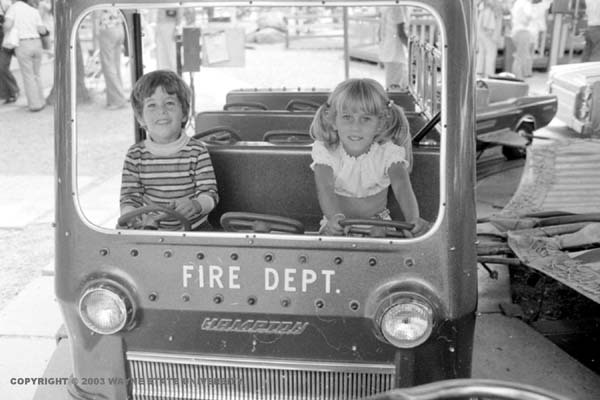 Remember it was a time when girls wore dresses and not pants, so we sure had to be careful on the rides (check out the pictures how the girls were dressed). We used to catch the first boat to the island and get the last boat back at night. The moonlight cruise did not stop at the island, just made a round trip. 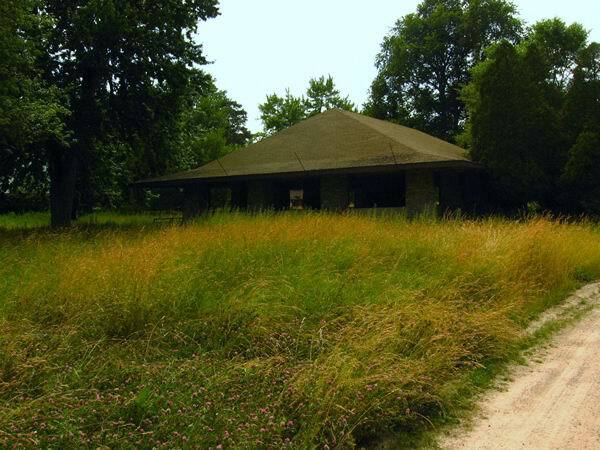 We used to go a couple more times during the summer, and my mom would pack a big picnic lunch for all of us. It was really good memories. I was able to take my own son once before it closed down so he could see the fun. Memories, Memories, Memories. Thank you Bryan the picture is great! We are working on getting a really cool wind spinner done in the shape of a boat wheel with a picture of the Ste. Claire in the center. We don''t have the actual spinner yet but the rendering looks great. If anyone would like to see pictures of the island and current work being done on the ship visit: www. myspace. com/cptboblo2 Once the page opens click on pics and enjoy. GO BOBLO!. I have the photo you are looking for here is the linkhttp://www. mhsd. org/photogallery/2008/images/6-08. jpgenjoy. Support the Boats!. If anyone has a nice picture of the Ste. Claire sailing without the metal shield with the portholes on it please send them to me. We are looking for a nice picture to put on a unique wind spinner. All the profits from merchandise sales will go to help the restoration. Please help refloat the boat!Thanks!. Currently a group of volunteers along with the owner, Ron Kattoo, have been working on restoring the Ste. Claire for future generations to enjoy. Everything has been taken off the Ste. 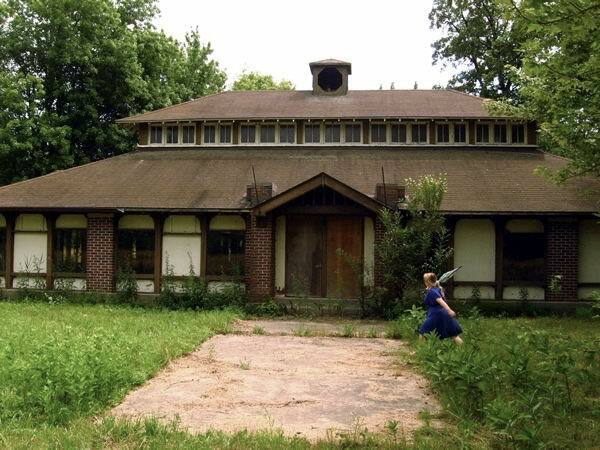 Claire and the rebuild should begin in the spring of 2009. Also, new merchandise is in the works to help generate money for the rebuild. Completed or not we hope to have her docked near Detroit for her 100th birthday in 2010. We believe that even if the rebuild is not complete people would still enjoy seeing her and the work in progress. 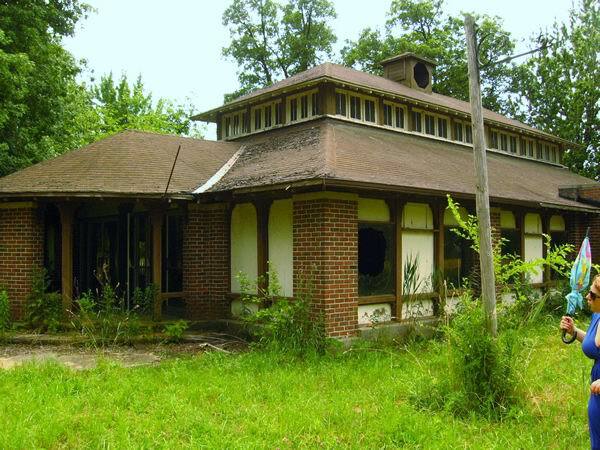 For more information on the restoration project please visit:www. bobloboat. com or www. myspace. com/cptboblo2Hopefully we can relive the memories one day. The Boblo Boats are docked at the old great lakes steel plant, now owned by United States Steel in River Rouge,MI. One looks to have been restored, the other is in shambles. Both of them still afloat. You can take a ride down W. Jefferson to Memorial Park in Rouge turn onto E.
Great Lakes ST. toward the river. Take that road down just before the second set of railroad tracks make a right on that road, they are sitting on the left hand side of that road in a canal off of the detroit river. I see them almost everyday, I sure miss going to the island, I was a kid when they closed it. I went the last summer it was open. I remember it vividly. I was running to the bumper cars,tripped over a garden hose and tackled a 55gallon drum. Tore up my shoulder for the rest of the day. 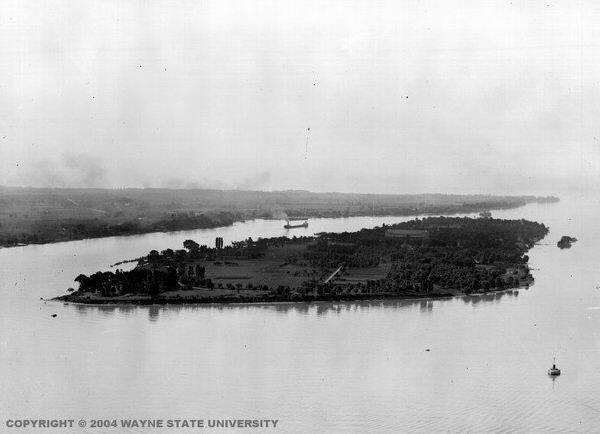 I also grew up in Wyandotte, at that time they no longer picked up at Bishop Park. I think the pick up area was Gibraltar. 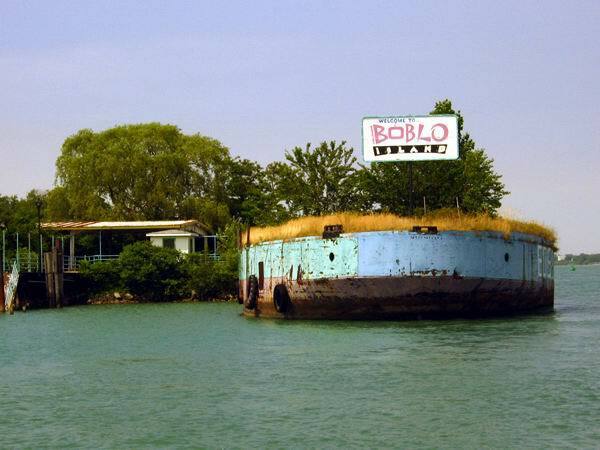 The good old Boblo Island, I guess thats just one more thing that has disappeared from the Detroit area. 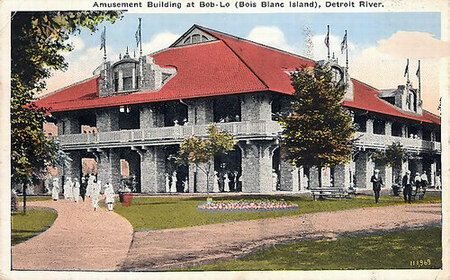 One of my father''s summer jobs in the late 20''s was on an excursion boat that plied its trade between Detroit and the amusement park on the Canadian Island of Boise Blanc (pronounced Bob-Lo) just before Lake Erie. Stan often told this story about working on the boat. Since the boys of the crew would be on the boat from morning to night, they liked to take a swim in the river when they were let off work. They had to be careful because the current in the Detroit River is very strong and tried to pull them away from the area around the boat. Once a braggart was hired to join the crew and on only his first day, he antagonized practically every one of the boys. Never-the-less, after work, the boys invited him to cool off by joining them in a river swim. When he was having a good time, although he was having some trouble keeping up with the current, the designated boy broke a bunch of left-over doughnuts in half and threw them into the water so the floating pieces would wash over the nasty boy. While the pieces and doughnuts swirled around in the river water, the boys were all yelling, ''Watch out! They''re flushing the toilets!'' The know-it-all had to be rescued from drowning and Dad continued gloating about the trick the rest of his life. I am curiouse as to what happened to the ships they used from the Gibralter,MI docks. I traveled to the island from the DETROIT,MI DOCKS (COLUMBIA) and from the GIBRALTER,MI DOCKS on the smaller faster ferry''s I believe one was named the (HURON ). as for the ST. CLAIR I saw it docked last year down in OHIO just NORTH of the VETERANS MEMORIAL SKY BRIDGE off of I-280 NORTH. That will be realy sweet to see it run under it''s own power again one day. It would be a crowning moment to see someone come to the true aid of the COLUMBIA ,And once again travel the river. THEY ARE MAJESTIC SHIPS OF A SOMEWHATE FORGOTEN TIME AND PLACE. They need to live again for the people to regain a part of their past or a little of their childhood memories ,to come to life. Oh for the glorious memories may they all live on for all of us. I am 63 years old and I remember Bob-lo so well. I was born and raised in Wyandotte, Michigan. The boat would stop there to take people to the island for the day. There were several trips from Detroit each day, but only two stops in Wyandotte. One to pick up, and one to return people. When I was in high school earlys 60''s, a couple of friends and myself asked our parents to excuse us from school, so my mom called and said I was sick that day in June. The three of us Jose, Elen and myself headed to the Wyandotte dock to catch the boat. 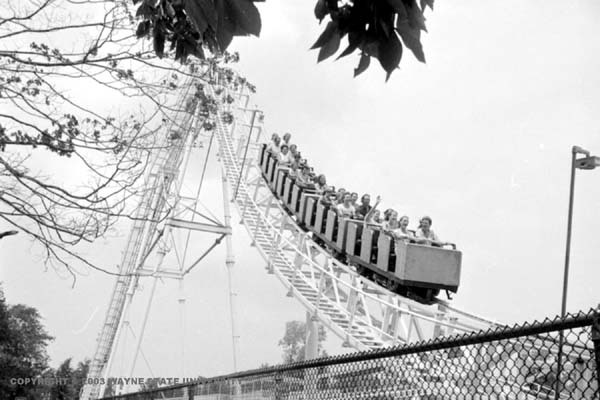 (the reason we skipped school to go that day, was the park was so crowded when school was out, and you would wait in long lines to get on a ride) after a full day at the park having a great time, we were on the airplane ride. It wasn''t crowded, and the cuite guy let us ride continuesly, so we thought we had it made! I remember hearing the boat blow that loud noise, and ignoring it. several times. We knew we had to be on it, but one more ride and we will run to the boat. That was it, we got off the ride, ran to the dock, just in time to see the boat pulling away. What are we going to do now? We decided to catch the next boat, and worry about it then. When we got on the next boat, we went to the captain, and cried that we had missed the boat to Wyandotte. He made an unscheduled stop in Wyandotte that day (there had only been two other unscheduled stops in the history of the boats, when women were in labor and going to deliver a baby, because Wyandotte Hospital is only one block from the dock)There was a photographer from the local paper, and he snapped a photo of us coming off of the boat. When it appeared in the paper, my mom was so embarrassed because she had lied and called me off sick from school. We had a lot of laughs about this over the years. The Bob-lo boat making an unscheduled stop. What memories. My parents who were married in 1945 visited Boblo a lot when they were dating. One of my favorite stories was of my dad who while in the navy jumped off the Boblo boat to save a woman who had jumped in a suicide attempt. don''t know the date but remember the story and remember seeing a news paper story about it. I have one better. My husband learned how to dance on the Bob-Lo boat. It was during a storm so at a 90 degree angle. So as we joke, at a 90 degree angle in a storm. We''ve been married for 40 years. He had to learn how to dance for our wedding. Loved the boat and the park. I am so sad every time I think about Bob Lo. It was awesome place. 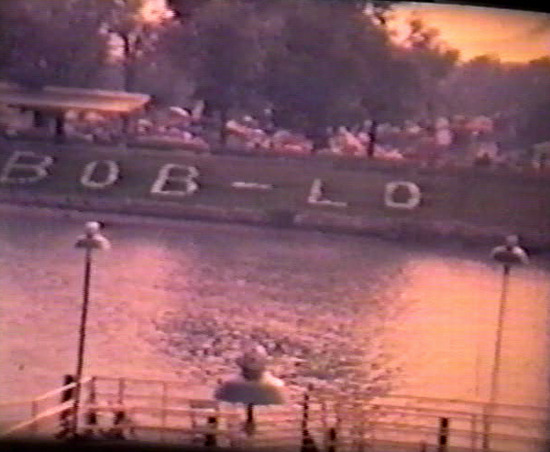 We went alot and when my family''s jobs had company picnic it would always be Bob Lo. Anyone remember how much fun the dance floor was and how beautiful the boats were. It was like a little cruise. 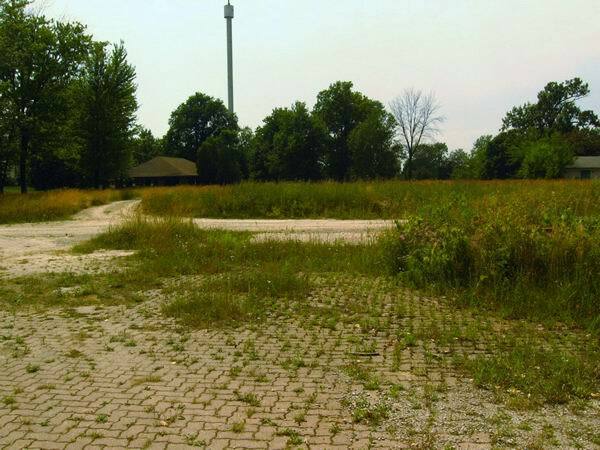 Here''s an idea, since so many people want a decent half mile oval near in Metro detroit to replace Mt Clemens , (as if you could) and sooo many people want an amusement park, Why not build em on the same grounds. That way the familys that have people that want to do one or the other but get bored at a race can go at the same time, people that ordinarily wouldn''t go to a race might discover how cool racing is and the land use would make since. The 24 hours of Le Mans has an on site carnival. yes i know toledo is a half, but the regular show there stinks, and it''s too far away and the Rock is toooo small and round. 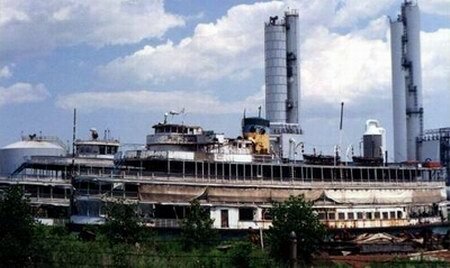 It would be nice if we could have another Bob-lo Island and use the old steam ships from Bob-lo the Columbia, Ste. Claire are still here. The Ste. Claire is being restored but won''t be completed for next year. They''re trying to have the Ste. Claire fully restored for her 100th year anniversary which is May 7th 2010. 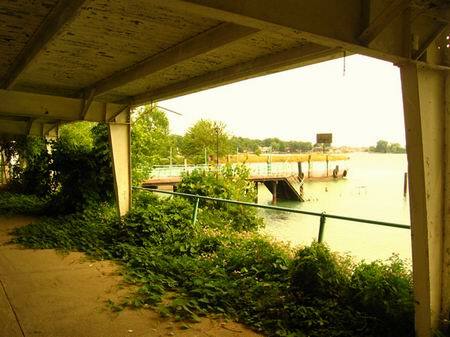 I can''t wait to ride down the Detroit river on the Ste. Claire again. But for now it''s cool just taking tours of the Ste. Claire all the money raised form the tour''s goes for restoring the ship. too bad someone does not do something to recreate this attraction. I remember as a kid my parents taking me on certian Sunday''s and holidays. the boat ride was a blast, almost better than the park itself. Too bad that Island is just sitting and more than likely going to end up being used for condo''s or apartments. heck, we all know we need more of them (randy said sarcasticly). I worked for Apache Security the Summer of 80, It was there I met Eliana Vargas. She worked The Buff (concessions). We have been Married for 23 years now and have a 15 year old Daughter. I Remember only having 2 days off that summer. It was the Summer of The Great Moon when one of the Buff people mooned the other Boat as Ronald Reagan passed. That was the summer of the Republican Convention. Ok Ok, yes he got fired. It was also when i escorted Rosa Parks on board for a catered party given by John Conyers. We would get off around Midnight go to the Downtown Bar at Lafayette and Shelby (not there anymore) and see how many Beers we could down before closing time. ok thats all for now. Later. Tawana, one of the boats just came back and is being restored and will give rides next year I hear. I grew up on Lakewood and it was always a big trek downtown and across to the Canadian side. For some reason that''s how we went. I think we had friends in Windsor. 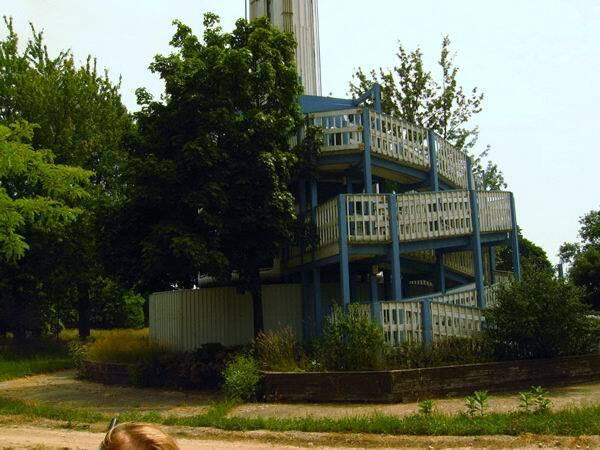 i use to go to bob-lo when i was a kid i moved from detroit to cleveland when i was around 11yrs old and did not know it closed until today which is 10-17-07 i am very disappointed my kids would of loved that park and the boat ride was the best part of everything i am very sadden by this news i only wished i could of shared the island with my kids. I grew up in Detroit and I recall going on the Boblo boat once a year with our church group from the Holy Trinity Church. My Mom would cook all day Saturday to pack a meal for the family. We would save our money to buy tickets for the rides. As I said, we go every year until I joined the Marine Corps but whenever I come home on leave, i would take my girlfriend then to Boblo island. Years later, I was transferred to Detroit to train the Reserves at Broadhead Armory at Belle Isle, I took my familty to Boblo Island in 1980 and every year afterwards until I transfer out. They last time I went to Boblo island was in 1985 with my family. I loved the cruise down the river the return trip was the best with music and all. I will attempt to visit the boat when I return to Detroit this fall when I visit my sister and brother. My father was the first mate on the Ste. Claire for many years. We went there often. The Ste. Claire is now in Toledo Ohio, owned by a private investor. Both the ships were built there. I have some pieces of Bob-lo memorabilia and remember it fondly. We used to visit Bob-Lo many many time in the summer when I was a small child. I visited there different ways. My parents had a small ski boat and we would go to what we called ''white sands'' which I presume was at the south side of the island. There was a good cove in which to water ski, and many of my parents friends would arrive in their own boats and we would all just enjoy and have our own picnic on the white sand. I would dig tunnels from the top of the sand and try to reach the beach, a rather scary thing as once it caved in and I was traped for a brief time. I never did that again. I would walk to the ''light house'' as I called it. One summer, the door which was always locked, had been pryed open and I walked the circular stairs. As I reached the first windowless opening, I would look for my parents on the beach. I would have to climb to the second windowless window to finally see them, at which point the bats that were hanging from the stairs above/behind my head, decided to leave and flew between my legs. Frightened, I ran back down the stairs and to the comfort of my parents. I don''t think I ever climbed that light house again. I would ask my mom if we could go and ride a ride or two. This was in the late 60''s early 70''s and Bob-lo went to the wrist band for all day users. You could purchase a single ticket and ride one at a time. The times that we would take the big ''Bob-lo Boat'' we would rush to the dance floor level and get a folding chair and claim our position on the boat. They would have a band that played to get the atmosphere going. The ride home was usually quiet. We loved to go to the lower level and watch the pump room and the guys working there. If there was any money left, we would ask to buy a souiviner at the shop on the boat. Small trinkets. Those were the best memories. I stand corrected. 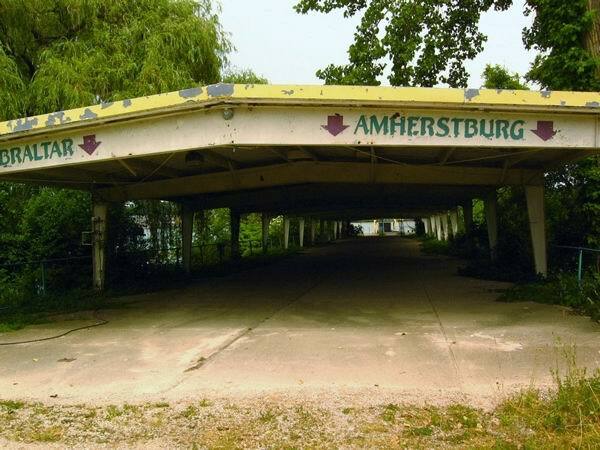 In reading others emails I realized it was Amherstburg where we''d sometimes catch the boat. I remember our annual trips to Bob-Lo fondly. I was one of 10 children and Mom and Dad packed us up each year and we had a glorious day, on the island. I think , if I remember correctly, we''d drive to Wyandotte occasionally to catch the boat there. 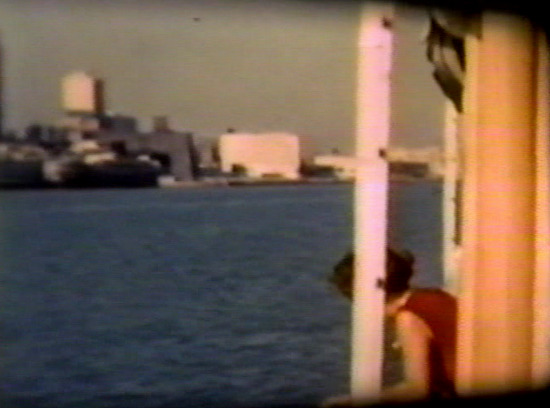 We lived in Detroit, so we''d take the boat from there most often. 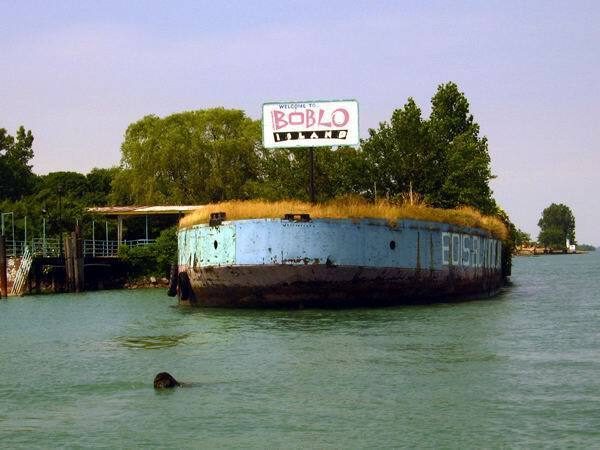 I moved from Michigan 30 years ago, but some of my sweetest childhood memories include Bob-Lo Island. I went to catholic school and we had a field trip to Bob-Lo every spring. I remember the boat trip most of all. It was a big party with music and lots of fun. We all had a sack lunch and spent the whole day there. I remember coming home so tired I could sleep through the next day. 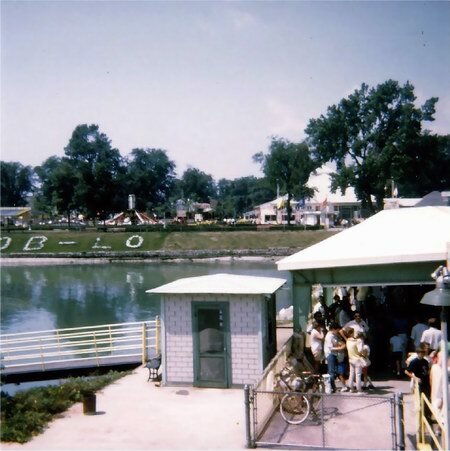 One time when my mom''s family was visiting from out of state my dad was taking us all to Bob-Lo but we just missed the boat rather then wait for the next boat we drove to Amherstburg and caught the same boat there. I never actually went to Boblo-Island. I just heard about it. I want to know, does the island have public access for visitors? I really would like to see how it looks now. Note from Webmaster - No it does not have public access, there is a car ferry but its use is limited to residents and their visitors. You can go by boat and walk on at your own risk which is a little touchy because it is part of Canada. Just remembered one more item. near the Ambassador Bridge there once was a ship that sank and turned on its side in the Detroit River and the best place to view it was from a passing Bob-Lo boat. All you could see was the reddish side of its hull. It''s great to remember Bob-Lo Island. Went there many times as a kid. My dad knew somebody at the office and we could sometimes get free passes. Just the boat ride was impressive. The whistle, passing the other boat on its return trip and waving to everyone, running around the boat, up to the captain''s wheel, Captain Bob-Lo, the greasy electrical smell and noises of the engines! Then the fun on the island itself. what a unique experience. And now it is gone, too very bad! The boats were always so nice looking, it would be super if someone would restore them if possible. But with today''s high prices, a lot of family entertainment is out of reach. 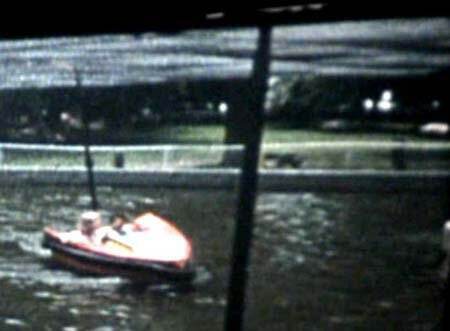 The promo photos of the boats in 1965 show them unusable. We went to Bob-lo in 1976-77 on those boats. I also question the opening in 1949. As a kid my family went every year to Bob-lo. 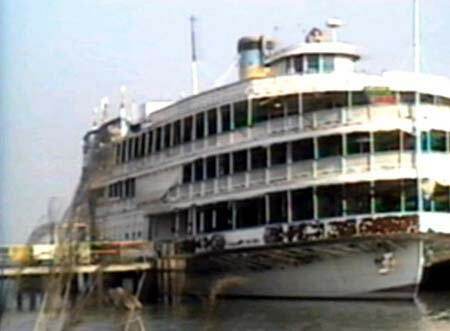 SENTIMENTAL JOURNEY: Boblo boat may sail again Doctor plans to restore the Ste. Claire to include movie theater, restaurants, bars December 3, 2006 Email this Print this BY MARGARITA BAUZA FREE PRESS BUSINESS WRITER Dr. Ron Kattoo's childhood was filled with sun-soaked trips to historic Boblo Island, where he spent summers dancing, picnicking and riding on roller coasters with friends and family. Since the Canadian-owned amusement park shut down 13 years ago, Kattoo, a hard-charging doctor at Henry Ford Hospital, has followed every development regarding the island and the magnificent steamboats that transported him there. 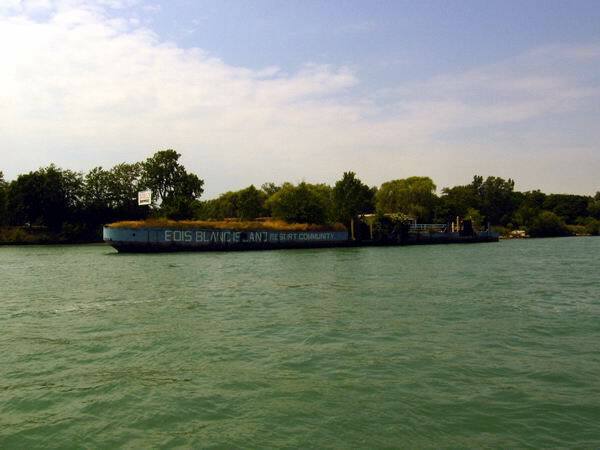 The 100-year-old vessels that chugged up and down the Detroit River to the island south of Grosse Ile have exchanged hands numerous times since they were built. Today, a New York investor owns the Columbia. The Ste. Claire is in the process of landing in Kattoo's hands for restoration and use for dining, parties and cruises. It's a dream he's had since he saw the boats in 2004 sitting in a shipyard in Lorraine, Ohio -- where they had been deteriorating since they were retired when the island park closed to the public in 1993. The island is now home to a luxury condo project. I'm sure it will make a lot of money, Kattoo said. But it's more than that. 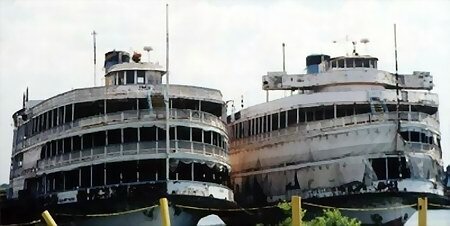 I want to bring the Boblo boat back to Detroit, where it belongs and where people will enjoy it the most. Kattoo, associate director of Henry Ford's intensive care unit, and his Maximus Corp. -- which he formed with friends Stephen Najor and Nicole Orow -- are in the final stages of acquiring the boat from Diane Evon. Neither party is disclosing how much the boat cost. Evon and her former husband, John Belko, paid $21,000 for it in September 2001. 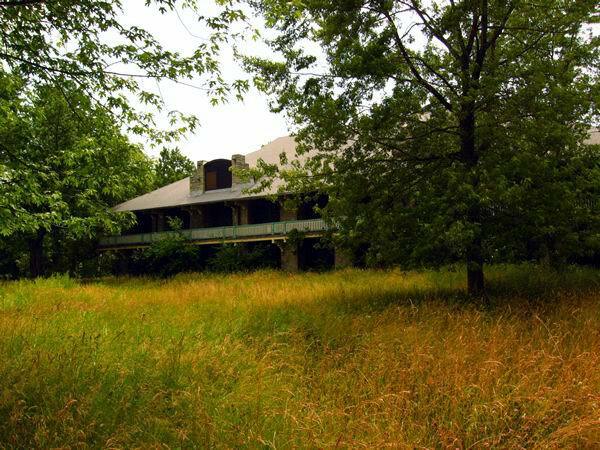 The Cleveland couple spent $600,000 in restorations. 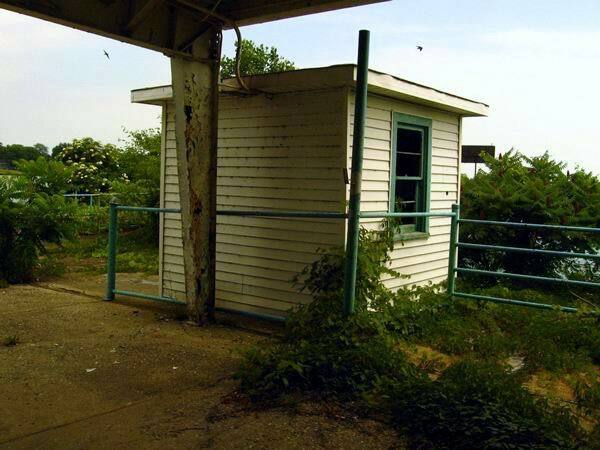 They've run the boat as a haunted house while it was docked in a Toledo shipyard. Kattoo's chance to buy the Boblo boat came this summer, after the couple divorced. Evon, who acquired the boat in the settlement, was running out of money and time to dedicate to the project. I couldn't move the project forward aggressively on my own, Evon said from her Cleveland home. 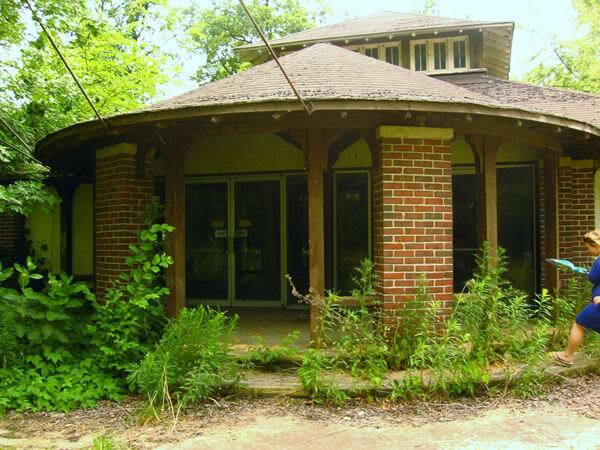 I also wanted someone who wanted to see her restored for her historical value, she said about the 200-foot Ste. 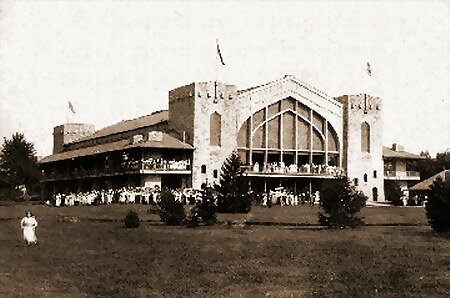 Claire, which was built in 1910 and holds 2,416 people. Someone who had an emotional connection was absolutely critical to me. Ron has that. Kattoo had been preparing for this. He befriended Evon when he saw the boats in 2004. When she offered to sell the Ste. Claire, he phoned his wife, Danielle, 30, and his friends, Najor and Orow. Let's do it, they all said. That reaction is typical of people who know Kattoo. At 39, he is in charge of one of Henry Ford Hospital's most demanding departments. Kattoo, married for three years and with a 10-month-old son, just finished a book titled Critical Care Made Ridiculously Simple. He's a member of Independence Township's volunteer fire department. Several years ago, the Bloomfield Hills resident survived a bout with bladder cancer and lost a kidney because of the treatment. He has amazing ideas and achieves what he sets out to do, said his wife, Danielle. He really doesn't stop. That's why I fell in love with him. His drive comes from a deep place, she said. His mother died of cancer when he was 16 and then he had cancer, she said. He worked really hard to get where he is right now. And I think he wants our son to be financially secure. On any given day, Kattoo is handling blueprints and paperwork for the Coast Guard or other government agencies that must approve any work to be done to the historic boat. I think working in an ICU allows you to handle many complicated situations, he said. You're handling 30 patients at once, and there are so many things that are out of your control. It makes a project like this seem relatively simple. Kattoo already has taken over the project. He and his business partners ran the Nautical Nightmare haunted house this fall. When that shut down, he started lining up architects and contractors to get his fantasy boat going. He has been making trips to Toledo before storing the boat for the winter, prepping it for the construction that starts this spring. This all happens between long hours at the hospital, managing a household and being a father and husband. Kattoo's plans for the boat, which he expects to complete by the spring of 2008, are grand. He will keep the haunted house as an annual fall event. 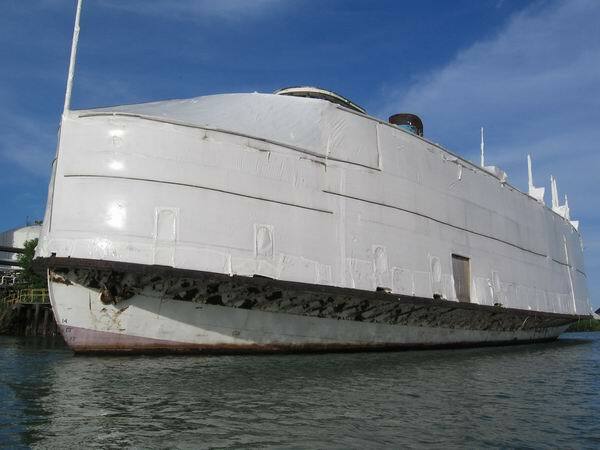 He is also restoring the boat into a sparkly floating fantasyland of restaurants, clubs, movie theaters and bars. He will rent it out for proms, weddings and private parties. He will revive the moonlight cruises. According to his business plan, the main deck will have four private suites available for rent. The second deck will have a ballroom; the third, restaurants. The outer deck will have open-air seating, a bar and an outdoor theater. Somewhere, the boat will have a museum that highlights its history. Kattoo said he plans to finance the project with his and his partners' money. He's also seeking investors and sponsors. Because of the boat's historic status, he's applying for restoration grants, private support and venture capital. Gloria H.
Davis, a 76-year-old Riverview resident who rode and enjoyed the boats in her youth and adulthood, said she can't wait for the project to take off. I think it will draw lots and lots of people because those boats are icons in this area, Davis said. Those boats represent happy times. My husband taught my oldest daughter to polka on one of those boats. I hope to live long enough to ride on the Ste. Claire again and dance on her ballroom floor. Kattoo's priority is to move the boat to Detroit as soon as possible, so Detroiters can benefit from the work generated by the boat's restoration. He's looking for a place to dock it. No matter where this ship is docked, people who come across it recognize it and tell me their stories, said Kattoo. They'll say, 'This is where I had my first kiss,' or 'Some of the best times of my life were spent on this boat. ' Some people go into medicine for the money. Others do it for a more altruistic reason -- helping people. I see this very much as the same thing. This is my way to give something back and make people happy. 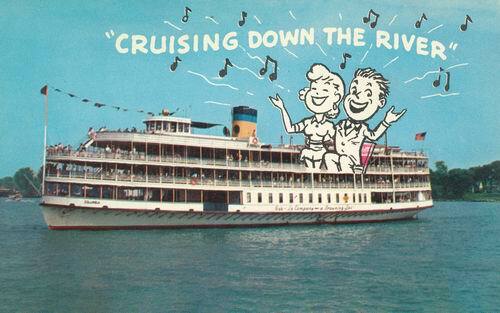 I remember going to the park as a kid and later playing in a band on the moonlight cruise down the river on one of the Bob-Lo boats which was fun. Definitely a case of missing it more after it was gone and realizing I had taken it for granted. Cedar Point is great, but it is pretty far away, crowded and expensive. It would be nice to have a smaller park to go to for the day in the area again. When I was a Kid, 2 of my sisters were Highland Dancers, twice a year we would go to Boblo for competitions. I still remember the year I was finaly old enough to go on the rides by myself, I saved my allowance for weeks so I could buy my pay one price ticket, and my friend Gordon (his sister was a dancer with my sisters), and I went we went on everything at least 3 or 4 times. Great memories, we would always take the Small Ferry from Amhersburgh, but I did take The Big Boat a few times. I was quite sorry when I heard that Boblo was closed. 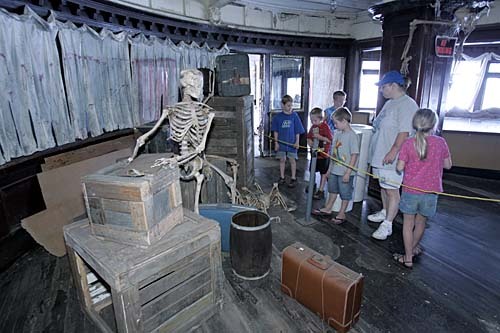 I was thrilled to see the old Bob-lo boat last October 2005 for their Haunted Bob-lo boat cruise theme. It was set up like the titantic cruise with all sorts of skeletons sitting at their dinner tables, the band was set up, music playing, and they even walked us threw sections set up as rooms for their haunted guests. It was an amazing set up and the captin of the ship looked wonderful with his fake eye and walking ghost look. Though I can say I think the trip to find where the boat was docked was more scarey driving threw the area to find it and that was FREE! ha ha! 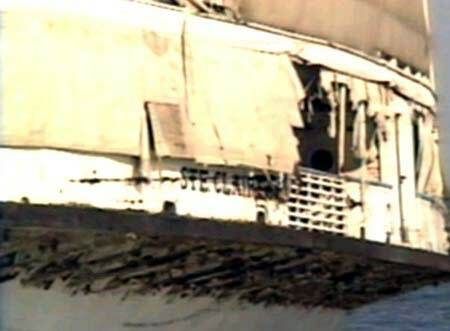 Its amazing how the memories flash threw my mind when I walked onto the ship and walked up the stair way. I could imagine the sound of the boat horn as I remenised. That was the only part missing. 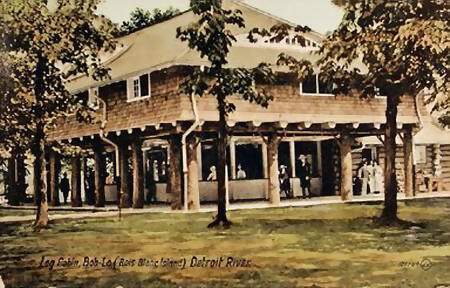 By Amy Lee / The Detroit News RIVER ROUGE -- Nostalgia tours have replaced river tours aboard one of Detroits beloved Boblo Island riverboats. The Ste. 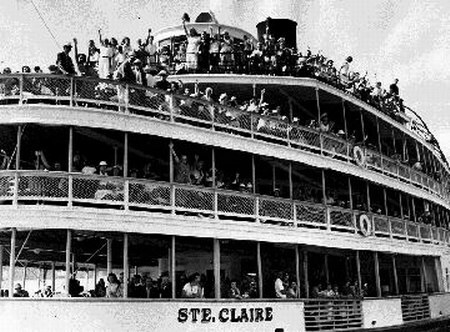 Claire, a hulking steamer that ferried generations of Detroit families to the now-closed amusement park on Boblo Island, this week docked at Belanger Park and opened its gangway to visitors for the first time in 14 years. 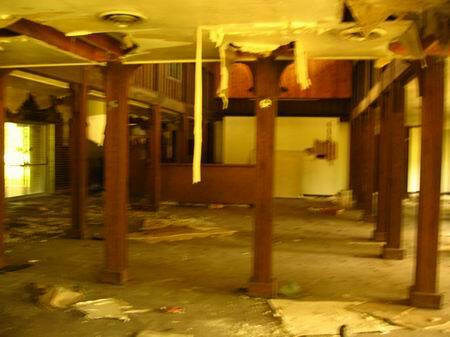 With peeling paint, debris-filled rooms and scattered tables and chairs cluttering the deck, the Ste. Claire is hardly a beauty. But that didnt stop Delrene McCain, 53, from recalling its glory days. Riding down the river on this boat was part of the excitement of going to the park, said McCain, who lives in Inkster. There was live music and there was always such an electric air on the boat. Everyone couldnt wait for what was coming next. 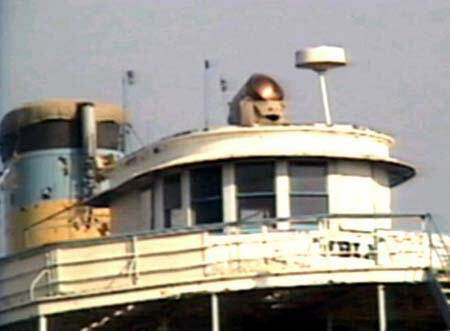 Metro Detroiters have waited more than a decade to see what was next for the aging steamer, which was retired from service in 1991 and has spent the past four years docked in Lorain, Ohio. 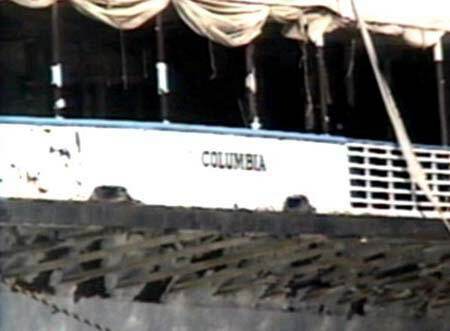 Its sister vessel, the Columbia, is moored south of the Ste. Claire in Ecorse but is closed to the public. 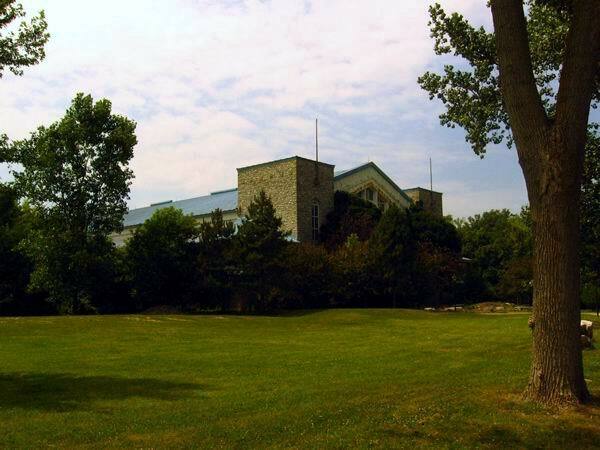 Cleveland businessman John Belko and his wife, Diane Evon, bought the Ste. Claire in 2001 for $20,000. They formed the Ste. Claire Foundation and have spent more than $500,000 to make it safe for visitors. Guided historical tours of the 197-foot ship are set to begin Sept.
2. Later in the month, ghouls, ghosts and zombies will populate the darkened corridors for a floating haunted house called the Nautical Nightmare. 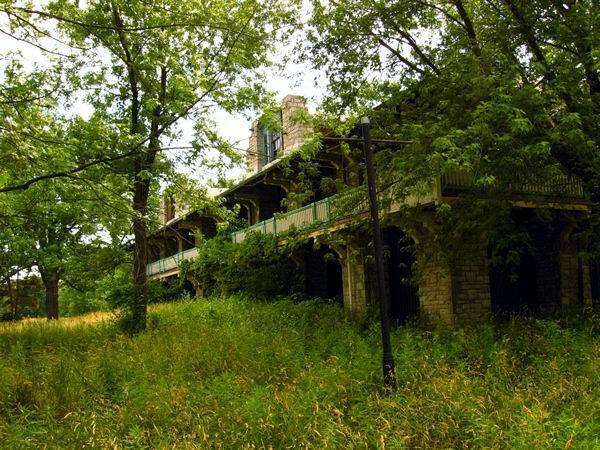 Both are designed to attract the attention of major corporations that could kick in the estimated $5 million needed to restore the 95-year-old Ste. Claire and make her steam engine operational again, Belko said. Im either nuts or on the edge of something truly brilliant, Belko said Thursday as various groups toured the boat. Crews built the Ste. Claire at Toledo in 1910, eight years after its sister ship, the 216-foot Columbia, was built in Detroit. The ships carried a combined 600,000 passengers in their peak seasons. Both were retired in 1991. 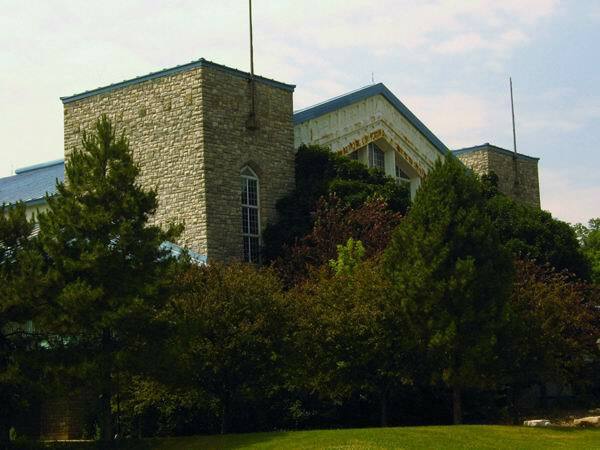 The Boblo Island park closed in 1993 and private homes were built there. Everybody forgot about it and I always wondered what would happen to it, said Troy Newman, 48, of River Rouge, who took an informal spin around the boat with his wife, Debbie. This brings back a little of the past. Theres too much history here to just destroy it. The Ste. Claire arrived via tugboat Wednesday night and accidentally tore off a 25-foot section of stainless steel waterfront railing at Belanger Park. Former passengers and even some volunteers tell countless stories of bizarre scenarios and accidents occurring on the boat, Belko said. Ive had some strange things happen on the boat, like lights going on and off and doors closing for no reason, said Belko, who said hes not a big believer in the paranormal. All Ill say is seeing is believing. 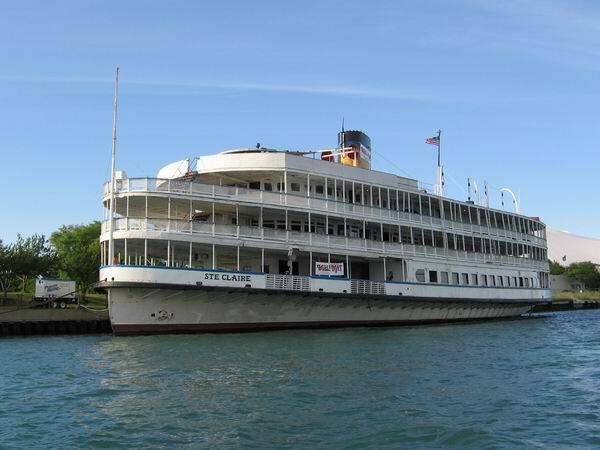 But I truly believe this boat is where she belongs, back home on the Detroit River. Remember during the summer Then Detroit Mayor Colman A. 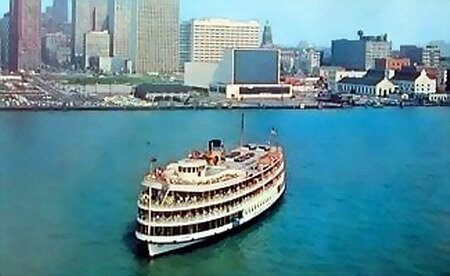 Young and WXYZ-TV Anchor Bill Bonds would have a Bob-Lo Boat race from the Island to the Detroit docks? My the girlfrind and I took a Bob-Lo Moonlight Cruise in 1983 but it all seems o long ago. 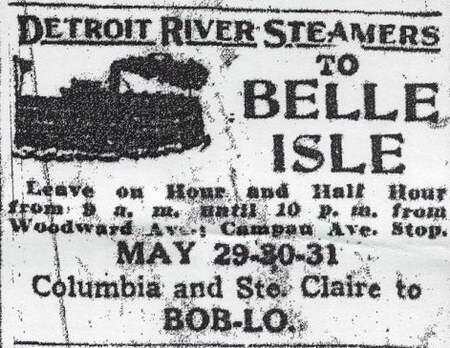 Another piece of Detroits history was lost when Bob Lo was shut I wonder if Belle Island will be next to go. 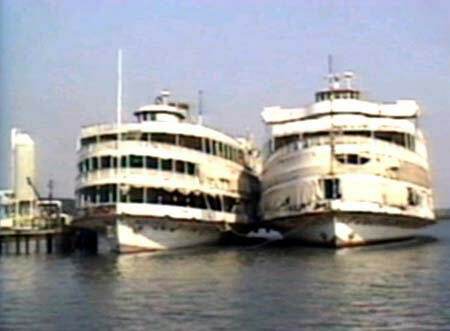 Its sad to see the two boats rotting away. I read in one of the Det. papers awhile back that one of the boats was bought and was to be restored. There was one ride I will never forget, The Bug. 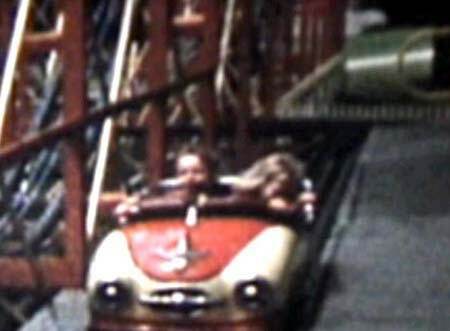 In the late 60s, my Mom, a girlfriend and I went on that ride and it frightened me so bad I could never go back again, sadly, two days later, two people were killed from that ride coming off the tracks. I will never forget. At the end of summer my mother, grandmother and aunt would take my brother and I to Bob Lo for the last hurrah of the summer season. We would meet my aunt at Sanders for breakfast and then board the boat at the foot of Woodward. The boat ride was always exciting and the return trip at night had a surreal quality as we passed the various sights along the river. 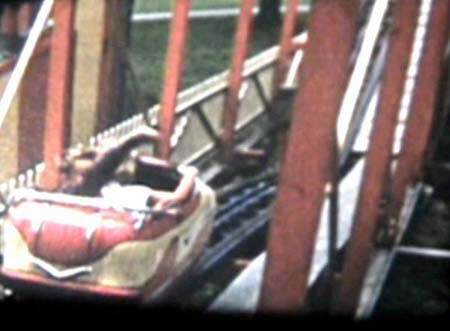 Although Bob Lo did not initially have a roller coaster, it did have one of the best wild mouse rides that I had ever been on. 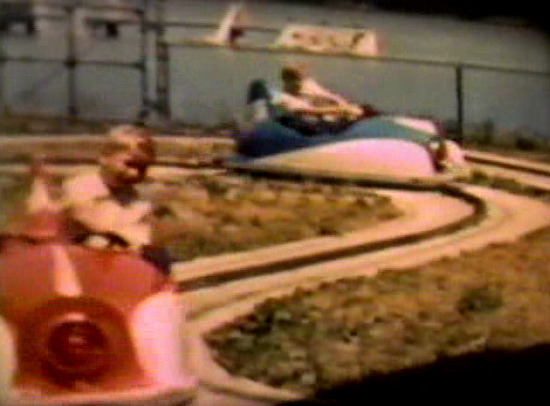 It was made out of wood and did not brake before the turns like the wild mouse at Edgewater. The first time I rode it I was scared to death and did not ride it again until I worked up my courage towards the end of our visit. It was a very beautiful setting and the train ride past the old dance hall was a throwback to the past. 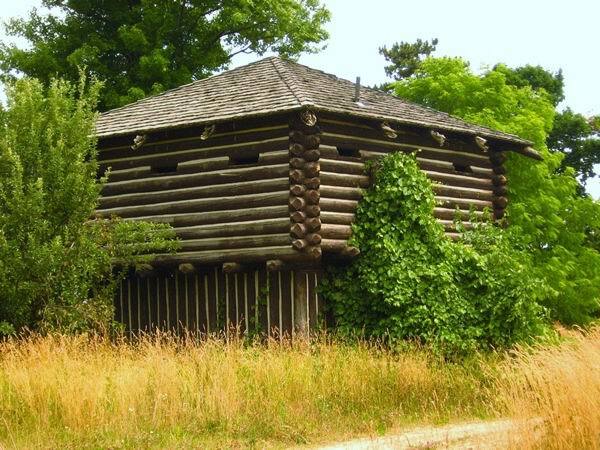 In the 1830s three blockhouses were built at the outer perimeter of Fort Malden, after the Canadian uprising against the British called the Patriot War, in which the Canadians were aided by Americans. The uprising caused the British to realize how unprotected their border with the United States was. During the American Civil War, the island became a stop on the underground railway for escaping slaves, on their way to Canada. Col. Arthur Rankin, M.
P. , bought 225 acres on the island from the Canadian government for $40 in the mid 19th century. 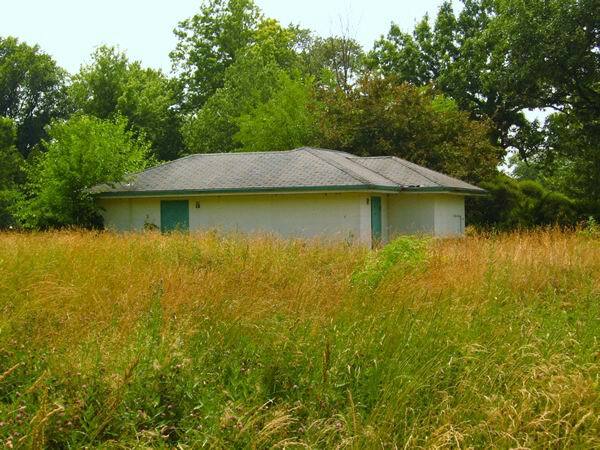 The remaining14 acres were held on a life lease by Capt. James Hackett, lighthouse keeper. The lighthouse was built in 1837. In 1869, Rankin sold the island to his son, Arthur McKee Rankin, who, going by the name of McKee Rankin, was a star of the New York theatre, and one of the fashionable people. 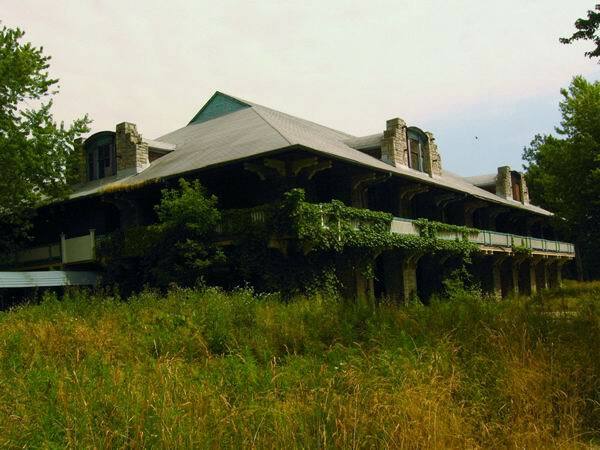 He built himself an elaborate estate on Bois Blanc, stocked the grounds with deer, wild turkey, and elk, built extensive stables, and played the bounteous host to his New York friends, the same set that held court at Delmonicos. Bois Blanc was on the map! Unfortunately, McKees stage career dried up as he aged, and his grandiosity and hospitality bankrupted him. Bob-lo was used as a base by the Shawnee Indian Chief Tecumseh, who had sided with the British, for raids on the American mainland during the War of 1812. The island was sold to partners Col. John Atkinson and James A. Randall. 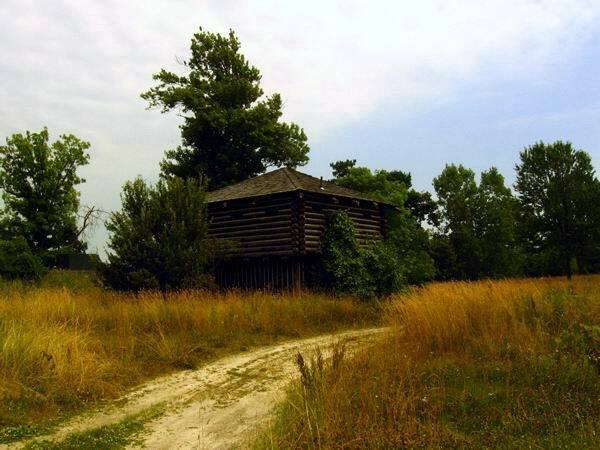 Randall built a house on the site of one of the British army blockhouses. His son, Tom Davey Randall went out duck hunting one night and disappeared in a sudden squall. When he failed to return and his body wasnt found, James Randall hired spiritualists and spent the winter on the island participating in seances in hopes of finding his son. The body was found the next spring when the ice melted. James Randall died in Detroit in 1911. 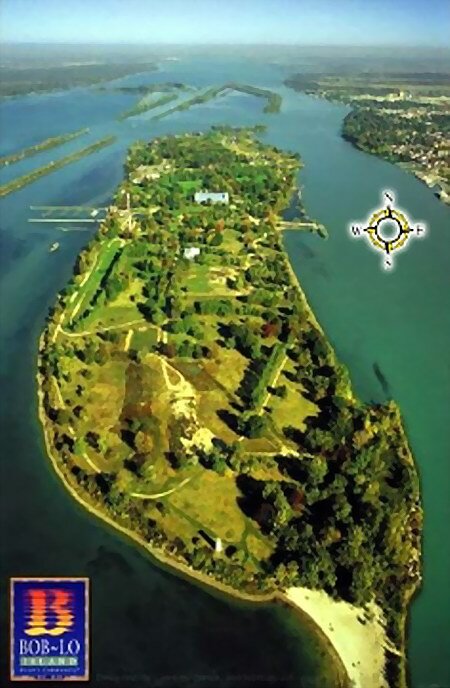 The heirs of Col. Atkinson sold the island to what was then the Detroit, Belle Isle and Windsor Ferry Company. 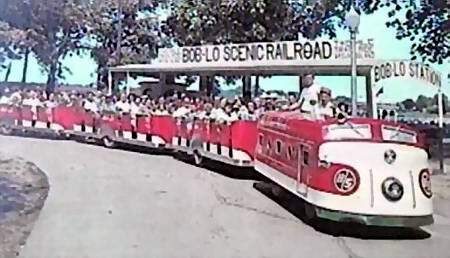 In 1898, the Bob-Lo Excursion Line was born. Bob-Lo was the best the non-French locals could do with the pronunciation of Bois Blanc, and it stuck and became official in 1949. A limerick appeared in The Detroit News in 1900: A maiden once said to her Pa, Oh Pa, can I go to Bah Blah? Her father said No! You cant go to Bob-Lo, the place is too terribly far! 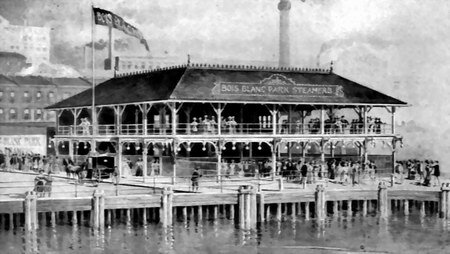 The first steamer that went to the island carrying picnickers was called The Promise. In 1959, Mrs. Martha Walpola, who had been on the maiden voyage and many successive ones, reminisced: Back on the first trip. I had to wear my new white dimity dress and stand beside my folks. My father wore a black coat and stiff white collar. My mother had on her best dress. We would stand and watch the dancers do the Its a Bear. The bouncers were there to watch and see that none of the dancing ladies showed their legs. A Detroit fireboat salutes the steamer Ste. Claire on a voyage down the Detroit River to Bob-lo. In 1902 and 1910 the steamers Columbia and Ste. Claire were built. They could hold over 2,500 passengers each. There was a dance floor on the second deck and a beer garden on the third. They carried as many as 800,000 visitors to the island yearly in the islands heyday in the 60s and 70s. The initial attractions of the island were mostly simple: a day on the river and a picnic in the park-like setting of the island. 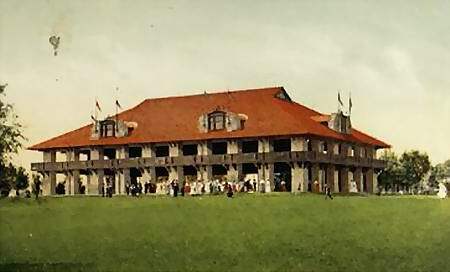 There was a carousel, and Henry Ford had a dance hall designed and built by Albert Kahn, which in 1903 was billed as the worlds second largest. Though Americans were providing much of the capital and most of the visitors to the island, it remained (and still is) a Canadian island. 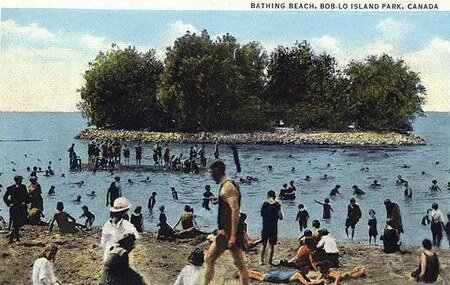 During World War I, U. S. officials made an exception, just for Bob-Lo, to the rule that draft-age men could not leave the country, deciding that it would be a hardship to young Michigan men to be forbidden to enjoy the island during the summer months. 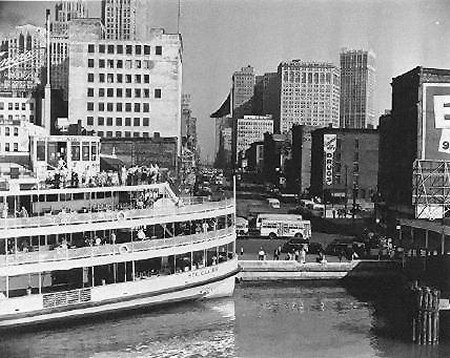 During the Great Depression in the 1930s, the steamers stopped their Bob-Lo excursions. The ships resumed operations in 1935. In 1949, bankruptcy threatened, and the Mayor of Windsor wanted the island for a national park, but Americans stepped in again and the island and boats were bought by the Browning family of Grosse Pointe, owners of a steamship line. 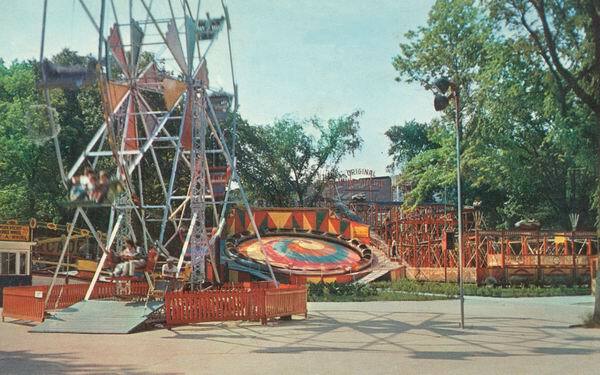 The Brownings transformed the island into an amusement park, building rides, roller coasters, and a funhouse. There was a ferris wheel, a dance hall, and an antique car exhibit. They brought in 300 exotic animals for a zoo, the first of which was a giraffe, Socrates II. When seven baboons escaped for two days in 1972, one had to be coaxed out of the funhouse. A mini railroad was built for rides around the island. Captain Bob-lo (Joe Short) was hired away from the Ringling Brothers circus to entertain the children on the Bob-lo cruises. 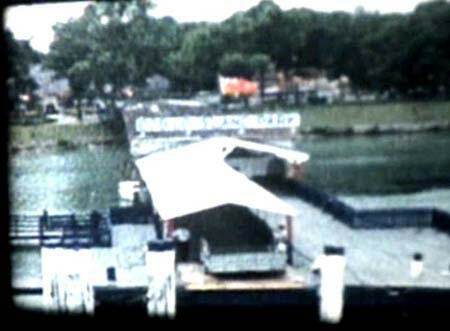 In 1961, the island landing dock was replaced with the deck of the freighter Queenston, sunk in place. 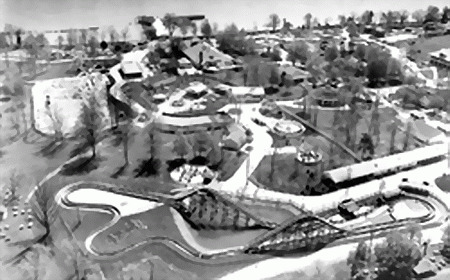 In 1973, the Thunder Bolt roller coaster, one of the largest in the country, was built of steel. Thrill seekers could ride the flume -- a log which carried riders down a water slide. 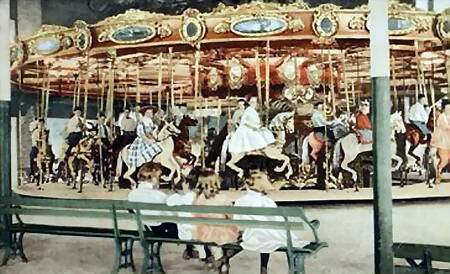 In 1975, the original 48-horse carousel from 1878 was restored and put back into operation. A great part of the romance of the island lay in getting there on the Bob-Lo Boat. It took just over an hour and there were moonlight cruises as well as daytime ferries to the island. Bands on the second deck dance floor changed with the times, from Mrs.
Walpolas turn of the century music (think Harold Hill) to the Big Bands of the 1940s to the Latin Counts of the 80s. Joe Short was Captain Bob-Lo, a diminutive clown who entertained the children on board. He had been hired by the Brownings away from the Ringling Brothers Circus and worked the boat until 1974, when he retired at age 90. He died the following year. 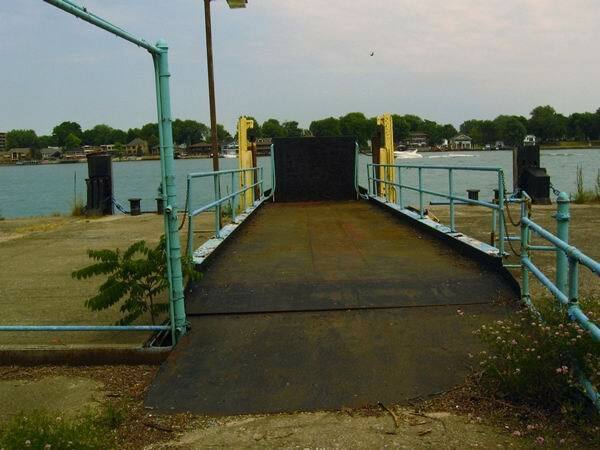 The boarding dock in Detroit was initially at the foot of Woodward, was moved to behind Cobo Hall, and eventually out of downtown to Gibraltal in 1991. 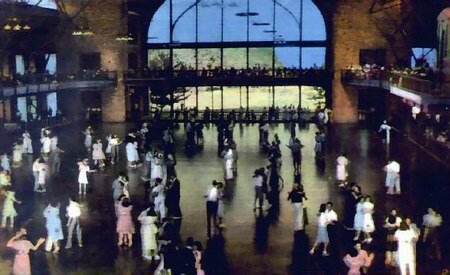 After the Brownings sold the island in 1979, it had various owners, including IBC, the owner of the Ice Capades and Harlem Globetrotters. AAA Michigan also held the island briefly. 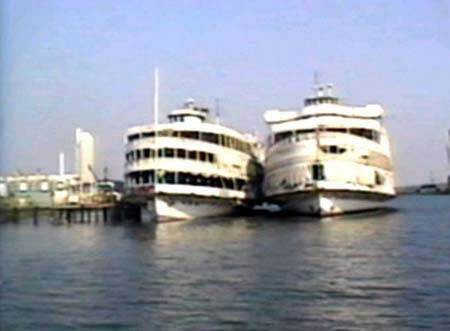 In the 1980s rowdiness on the boats and on the island caused diminishing crowds. Canadian police and immigration authorities spent a day at Bob-Lo rounding up members of the Outlaws motorcycle gang in 1987. The innocence of earlier times was ebbing away. 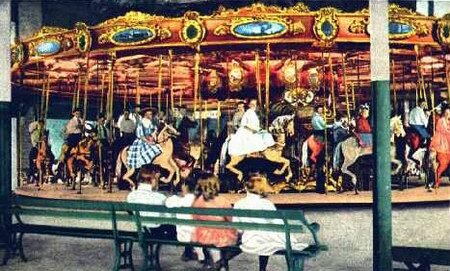 The carousel was sold off piece by piece at auction in 1990, with a $34,000 high bid for a deer and $21,500 for a horse by the famous carousel carver Marcus Illions. They were replaced by plastic replicas. 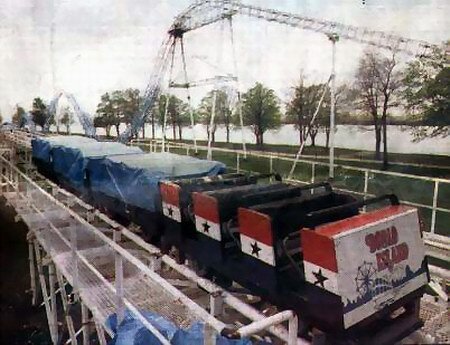 In 1994 the rides were sold off, and in January 1996, the Columbia and the Ste. Claire were auctioned. An era had ended, and families that had enjoyed the island for generations turned to more modern, more spectacular parks such as Cedar Point. 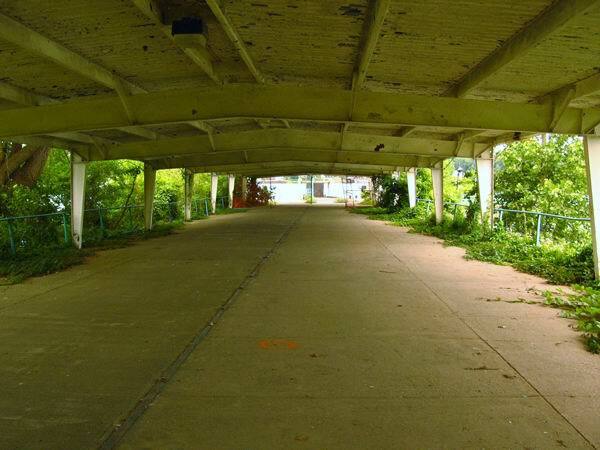 Detroiters lost more than an amusement park, or a picnic ground when Bob-Lo closed. They lost a piece of their history and a window back to a simpler time. 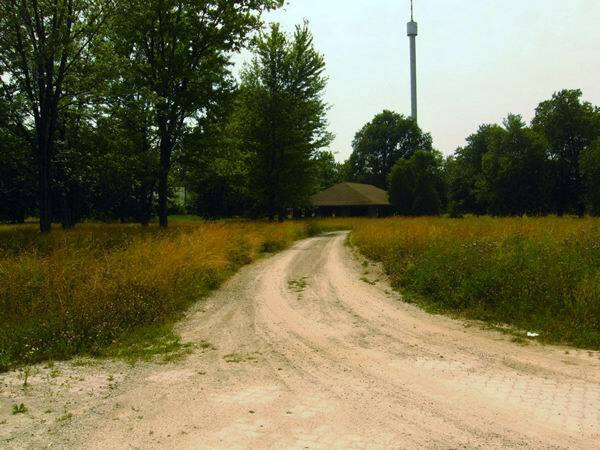 After undergoing several management/ownership changes, Bob-Lo Island was auctioned off in 1993 to a developer who is building luxury homes on the site. Happily, one of the Bob-Lo boats is being rescued after rotting in drydock in Ecorse for 8 years. More info to come.